Emergency medical personnel are trained to look for an ICE (In Case of Emergency) contact on a mobile phone if they cannot communicate with the the victim. My Med ID from Imadjine takes this concept a step further by providing more detailed medical information. Still, there are some downsides to the app you should be aware before relying on My Med ID. In Case of Emergency: My Med ID lets you enter medical and contact data, including any allergies you might have or medications you might be taking. My Med ID allows you to enter medical and contact information in a number of categories: Conditions, Medications, Doctors, Contacts, and notes. (Ideally, contact information would link directly to the entry in the address book of your iPhone or iPod touch, but it does not.) There are certain medical conditions that are crucial for doctors to know about in an emergency situation, and the faster they can access that information, the better. My Med ID has another notable downside. If you have a passcode lock on your phone, no one will be able to get to the information on My Med ID. So you would have to remove any passcode locks to ensure that the information in My Med ID could be accessed. However, if there’s no passcode lock, anyone who uses your phone could, theoretically, view the medical information you’ve stored in My Med ID. That’s sure to unnerve users concerned about their privacy. 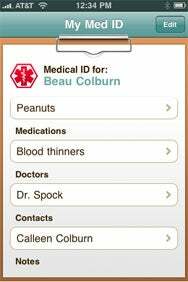 My Med ID is a nicely designed, easy-to-use app that may provide a valuable service for some people. But it comes with some privacy downsides—it’s up to individual users to decide whether the benefits of having medical information at hand in an emergency outweigh the risks I outline above.